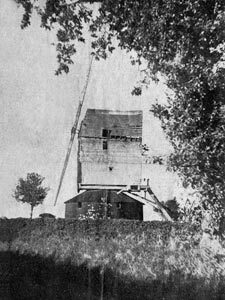 Catfield postmill was built in 1774, possibly on the site of an earlier mill and continued working for 148 years, finally ceasing in 1922. 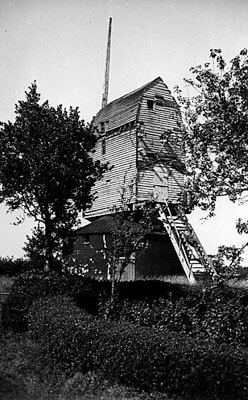 The mill was built on two storey brick and flint roundhouse that had a boarded roof with battens over the joints. 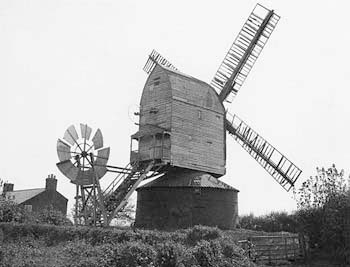 In later years, power for 2 pairs of stones was provided by 4 double shuttered sails, each with 9 bays of 3 shutters that were struck by rack and pinion with a chain wheel on the outside. The left handed, 8 bladed fantail was mounted on the ladder, the tailpole having been cut off. 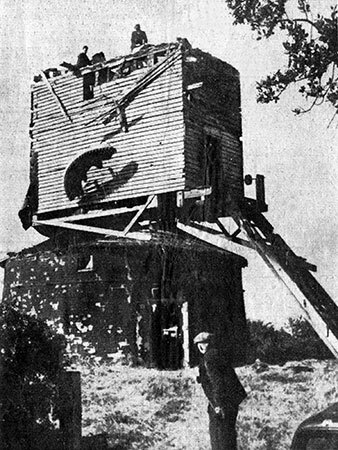 A boulting mill was also installed. 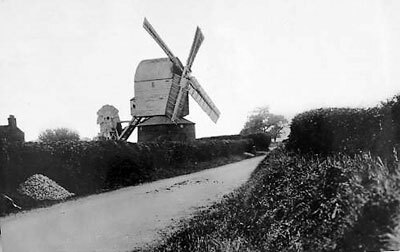 John Bygrave possibly also owned mills at Burgh St Margaret and Witton as he was mentioned in adverts of mills for sale in both places. With Brick Round House & Chamber over. The Mill drives two pairs of stones & bolting mill, her sails & going gear in excellent condition & she is now in full trade. A good brick & tiled Dwelling House … 2 barns, 2 stables, bullock lodge & granary over, convenient sheds, cart lodges, garden, yards & 3 pieces of Productive Arable Land containing with the site of the Buildings 9a.3r.24p. the whole being admirably situated for Trade near the Street at Catfield & within half a mile of the navigable River to Yarmouth. This desirable small Estate is in the occupation of the Proprietor who will give possession at Michaelmas next. 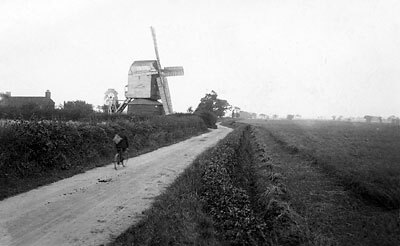 Mr. Vincent has conducted the trade of the Mill (which is considerable) most advantageously for a long period. Of the above the Mill & 6a.1r.0p. are Copyhold of the Manor of Sutton Outsoken, fine certain & the remainder is freehold. Land Tax £1.16s. per annum. At 4 O’clock in the Afternoon, in one Lot. For particulars & conditions of sale apply to Messrs. BLAKE, KEITH & BLAKE, Solicitors, Norwich or to Messrs. SPELMAN, Norwich & Yarmouth. A CAPITAL POST WIND-MILL With Brick Roundhouse & chamber over. The Mill drives two pairs of Stones & Bolting Mill; her Sails & going Gears are in excellent condition & she is now in full trade. Also a good Brick & Tiled DWELLING HOUSE, containing Parlour, Keeping Room, Kitchen & five Sleeping Rooms, Wash house, Pantry, Dairy, Cheese Room & Cellar, two Barns, two Stables, Bullock Lodge & Granary over; convenient Sheds, Cart Lodges, Garden, Yards & three pieces of most PRODUCTIVE ARABLE LAND. Containing with the site of the Buildings 9a.3r.24p. the whole being admirably situated for Trade near the Street, Catfield & within half a mile of the Navigable River to Yarmouth. Of the above, the Mill & 6a.1r.0p. 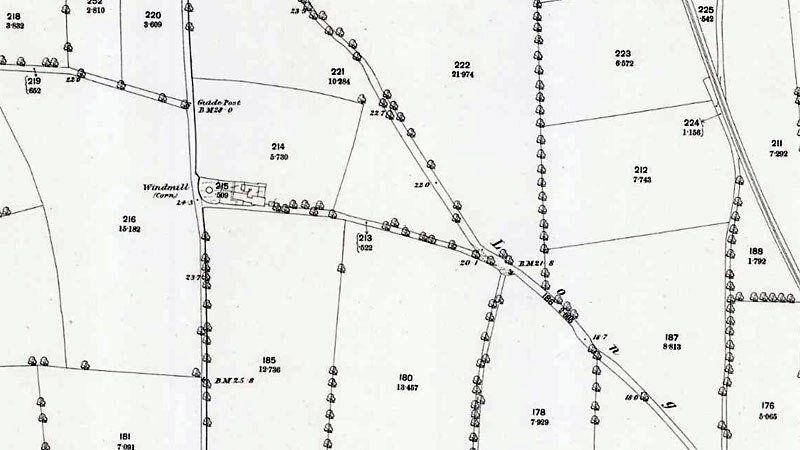 are Copyhold of the Manor of Sutton Outsoken. Fine certain & the remainder is Freehold. CLOWES & FLOWERDEW are favoured with instructions to Sell by Auction at the Crown Inn, Catfield on Monday June 22, 1863 at 4 for 5 o’c in one lot. Apply to Mr. Fred FOX, Solr. Or the Auctioneers, Bank Chambers, Norwich. A desirable Freehold POST WINDMILL with capital Freehold DWELLING HOUSE, Garden, Yard, Barns, Stables, Granary & suitable buildings & two Pieces of productive Freehold Arable LAND containing 9a.3r.24p. all in Catfield & in the occupation of Mr. Wm. Beck. Particulars of Mr. Fred Fox, Solr. Norwich or of the Acutioneers, Great Yarmouth. 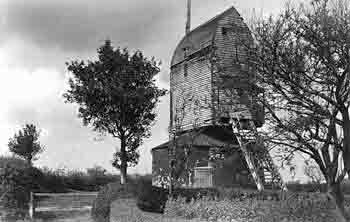 By 1934 it was noted that the majority of the tail gearing had been removed, weatherboard was falling off and the mill was generally becoming derelict. … a section of the sail of Catfield Mill, comprising twelve vanes with their working gear, may be seen at the Bridewell Museum, Norwich ... The sail of Catfield Mill has a blade area of 27 feet by 7 feet 6 inches. 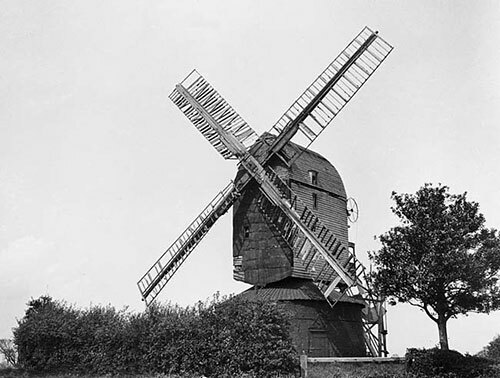 There were distinct physical similiarities between Catfield mill and Happisburgh_mill that had been built in 1773.